While developing one of my Android application, i found it was hard to find a good and simple tutorial on how to integrate Twitter into Android app. There are some external java libraries over the net that can be used to integrate Twitter into Android app, but they lack of good documentation and tutorial on how to use it on Android. So i made my own implementation using Twitter4j and oauth-signpost library. In this tutorial, i create one sample Android project to show how to connect to Twitter, save its token and username on shared preferences so it can be used later to post status to Twitter. To enable user to post status to Twitter, first you have to create one Twitter application. Simply go to Twitter Apps page and register your application. Fill the ‘Application Name‘ with your desired name, it has to be unique. If you use a name that already exist (taken by someone), you’ll get a warning message. On ‘Application Type’ option, choose ‘Browser’ , and because its a browser type application but used in mobile application, you can set it’s callback url on ‘Callback URL‘ field with any url you want. On ‘Default Access type’, choose ‘Read and Write‘ to enable access to post status. Click save and if all things going well, you’ll get a page showing your consumer key and secret key. Copy these two keys for later use in Android app. In my sample project, i create three helper classes (TwitterApp.java, TwitterDialog.java, and TwitterSession.java) to handle authentication using Webview Dialog and session handler to save token and username on Shared Preferences. This example shows how to connect to Twitter, display webview dialog to authorize user then save user’s token and username on shared preference for later use. First, create an instance of TwiterApp class with context, consumer key and secret key as constructor’s parameters. Use hasAccessToken() method to check if there is previously saved session. If there is no saved session, call authorize() to open authorization dialog. If user allows the connection, his access token and user name will be saved on shared preferences. You can setup listener to handle on success and on error event by creating an instance of TwDialogListener and pass it to setListener() method. This example shows how to post Twitter status. If there is no previously saved session, display authorization dialog to allow user authorize the connection then post status using different thread. – Fix authorization failed bug when attempt to authorize after logging out. This was caused by an exception (java.lang.IllegalStateException: consumer key/secret pair already set) was thrown by setOauthConsumer(consumerKey,secretKey) method of Twitter class. This method should be called once. Thanks very much it help me lot to solve my problem. Can Only TwitterApp.java itself can post the message on twitter. Where is the password getting updated ? Hey are you using Sugree’s API? I resolved this problem, i forget to change the callback url. thank you . it’s work. what should be the callback url? Have you got it working..I am also having the same problem.. I also get the same prob. What is mean by callback Url. Callback url is used on web based app. If your app is a mobile application, you can put any url as Callback URL. Is there any way of deleting the recently posted status in twitter from android..? i am also getting “Twitter connection failed” on device but its working correct on emualator. . . Can you tell me What the mistake i am doing ? ? ? Thanks so much, i’m try it :). I changed call back URL but don’t work. Ok, I have done. thanks. So why now are you saying to use ” public static final String CALLBACK_URL = “twitterapp://connect” ” instead of public static final String CALLBACK_URL = “http://twitter.com/#!/QGSVietnam”. I really do not understand about this issue. You can say more to you, please. Article is helpful to begineers like me but when i download ur app i hve error in TwitterApp.java in the CommonsHttpOAuthConsumer and OAuthProvider java class. it ask me to create new class with this name.. how to solve this problem? Hi, I have downloaded yr app and it works. Now I am trying to learn it and writing my app. While I have a question, why do u use Handler in TwitterApp.java? Why don’t u authorize directly? Thats a network operation and may block the main process, so its better to separate it from main thread. Hey are you using Sugree’s SDK? Hey are you using sugree’s SAL? can you get sugree’s sdk working, as im unable to post tweets using his code. Can I sign out from the twitter account using your TwitterApp class? This seems to be wrong. Because after i deleted the access token and restarted the application and again tryed to sign in, i still can see the user profile picture and “Signout” option in Twitter WebView Page(on top right corner). And in that web page there are no editfields to receive fresh username and password. I am guessing that Twitter Webpage has stored there credentials in it’s own shared preferences. How can we completely clear all login info so that it wont show those details again? You can use webview’s clearCache() method to delete all caches. Thanks for providing the information. I tried working on it. When I connect it to the mobile phone. and Press the Tweet Post button, it does not initiate anything. as in No Response. And it is mentioned that the twitter account is also Not connected. the Callback Url is the new value only. It would be helpful of you. Did you change the callback url constant in TwitterApp.java ? the callback url is “twitterapp: //connect”… Do you want me to change this callback url? i try your code ,it works fine could u pls tell how to add filter API in this apps. Hey ppl , I m not able to debug !!! i m getting Twitter Connection Failed ! I changed callback url !! I m not getting the dialog box where we have to enter the username password . pls post any perfectly working code !! Hi, i am trying your code and i have consumer as well secret key but all the time i am getting System error oauth.singpost.exception.OAuhtCommunicationException: communication with the service provider failed: http//twitter.com/oaut/request_token, i tried to resolve it but i can’t figure it out. Did you get it working? i am having the same problem. 1)when “deny” is pressed, should the webview be dismissed or do I have to add some code? 2)my boss wants me to write an application that can post on twitter without user interaction (I have login and password), but I dont think it is possible anymore, since now we have to deal with oauth. Am I right? I would like to close the authorize dialog box, when user clicks on “No Thanks.” How can I make it happen. still i m facing the same prob !! so please anyone post perfectly working code !! I figure it out its DefaultOAuther use CommonsHttpOAuth but still getting 401 error. Hi Piyush, coud you give me your sampe project (delete the keys first)? Thank you very, very much for a clear and concise description on how to get this working. Well done. I am trying to integrate the Twitter in to my App. I registered the app and got the consumer key as well as the secret key too. Whenever i tried to refer those in the code and execute the app, it gives me the following error. how can i send it to you? via mail? thank you it is very helpful. But I didn’t see my statu twitter. I am learning android from learning android book . Thanks for this wonderful post . Can i connect to twitter without registering my application , just by calling the twitter constructor and update status as i don’t have a url to register. hi, when i try to authorize, dialog box does not open, instead i get twitter connection failed message. My callback url is “twitterapp://connect” . I changed DefaultOAuther to CommonsHttpOAuth .I cant figure out what i am doing wrong. Could you provide the error log from logcat ? 05-24 17:28:03.838: INFO/global(2359): Default buffer size used in BufferedReader constructor. It would be better to be explicit if an 8k-char buffer is required. 05-24 17:28:03.848: WARN/System.err(2359): oauth.signpost.exception.OAuthNotAuthorizedException: Authorization failed (server replied with a 401). This can happen if the consumer key was not correct or the signatures did not match. Thanks a lot for this beneficial tutorial. do i have to add something to get this working or am missing something here? Hi Ahmed, i’m not using pin based auth in this tutorial. have u tried the code in this tutorial ? Have u done all the settings correctly? any error log info? Hey, thanks for great tutorial. I have only changed DefaultOAuther to CommonsHttpOAuth and added my own keys. The problem is that t wont work on my device over wifi, but when going over 3G or on the emulator it works just fine. It just displays loding for a while after i’ve put in my mail and passwor, then it shows “Twitter connection failed”. 06-17 17:30:49.815: DEBUG/Twitter-WebView(1429): Page error: The server failed to communicate. Try again later. i have a problem with your Source code, but i dont know how to fix it, can you help me please? Thanks for the awesome twitter app! I only have one question: Why it has to be type “browser”? A twitter app for android isn’t a client type? But i have question regarding “Application Type” – as we have implemented twitter related stuff in iPhone where it requires “Application Type” as “Client” – now if i change to “Browser” iPhone implementation stop working… Any help or pointer on this will be appreciated. I’m getting similar errors like one of the members from above. I’ve been on this for awhile, this will be my first time connecting to the internet from an android app. I’m sure it has to do with my Twitter & code configurations. So, your help is greatly appreciated. Hello, could you give me the log cat error? [2011-07-19 19:11:47 – testconnect] Android Launch! [2011-07-19 19:11:47 – testconnect] adb is running normally. [2011-07-19 19:11:47 – testconnect] WARNING: Application does not specify an API level requirement! [2011-07-19 19:12:01 – testconnect] Success! [2011-07-19 20:12:24 – testconnect] Android Launch! [2011-07-19 20:12:24 – testconnect] adb is running normally. [2011-07-19 20:12:25 – testconnect] WARNING: Application does not specify an API level requirement! [2011-07-19 20:12:28 – testconnect] Application already deployed. No need to reinstall. Hi pvu, this is not what i ment. Copy the logcat error from ddms. I sent it out twice, but it’s not showing up in the forum. Hmmm, maybe it was too long. Let me know if I can send an attachment to you. Thanks for this awesome post. It is very helpful. Would you like to tell, is it possible to post all these three things (some Text + any image from sd card + any url or link ) in a single post. Hi, to post image, you have to use third party image service api such as twitpic. it work,.but after click Authorize app,. I am getting the following exception while running the app in DEVICE, but where as in EMULATOR it’s working properly..
java.net.HttpURLConnection receives a 401 (Unauthorized) from the server. Do you use different sdk on emulator and device? i.e.,whether TWITTER will work in Android 2.1 or not, because..My application is working for 2.2 but not its not supported it 2.1, when I tried to execute in 2.1 I am getting the above error..
Hi guys! I have the same issue as Kiran Kala. 2.2 and above is working and on a 2.1 device or emulator is not. Does somebody have any idea why is this happening? Thanks for the guide. I thought I would post my experience. 1) Didn’t work with latest twitter4j-2.2.4 build. Sorry, I didn’t keep the error output, but the problems seems to be that package paths have changed. I used the 2.1.6 branch bundled in the ExtJars file to resolve the problem. 2) Instructions for setting application type have changed. There is no more option for setting application type to Browser. Instead you just need to specify a callback URL or you will see this error in the debug output. I found this message in a TCP packet capture. Thanks for the tutorial. Only took an hour for me to add Twitter feature with your help. Hi Shawn, thanx for sharing your experience, this is really informative and helpfull. 08-15 13:45:32.740: DEBUG/UpdaterService(1347): Updater ran. Seems like you had problem with authorization, did you finish the authorization process? yes i did…i got this working, i had a problem with proxy server access. Anyway, i need to have option of changing twitter account. How do I do that? 08-18 13:44:34.109: WARN/System.err(1941): java.lang.IllegalStateException: consumer key/secret pair already set. Hi, have u tried to create new instance of TwitterApp ? This code runs in moment when im logged on twitter with one account. When i click on “change account” button, i need to log out, and sign in as a different user…You know what i mean? on line when im calling authorize method. for re-loging in. Hi, try to use current activity as the parameter for TwitterApp constructor, new TwitterApp(this). at the fist time when application running, i can do a success login to my acount, and ehen i want to legout and then login again, it become failed to connect to my acount. could you give me the log cat message? TOKEN_ERROR failed to get request token Communication with the service provider failed android : http://api.twitter.com/oauth/request_token. My problem is that..my twitter dialog doesnt get disapper after authorization. Many thanks Loren’z, your post helped a lot. Thanks a lot for this lorenz! The only problem I run into is that using 2.1 API level after I enter my credentials and try to login a blank page appears and nothing is happening. While Creating an app in twitter there was no option like browser or client,why? Hi, Twitter has changed the app settings page, there is no setting for client type anymore. From you logcat, i think the problem was on your network connection. hi..i downloaded this and when i import this to my application and after typing the status message and when i click on twitter button nothing is happening,still its just showing the same main UI…please help me out…. Did the internet connection work properly? DEBUG/TwitterApp(291): Failed to get request token. oauth.signpost.exception.OAuthCommunicationException: Communication with the service provider failed: Received authentication challenge is null. i always error authencticate at class TestConnect “Twitter Connection Failed”, but if i authenticate at TestPost i always success, why it happen? as i know they use a same function but the result is different? ? Have you set the callback url on application web settings (https://dev.twitter.com/app) ? Hmmm, did the internet connection work on emulator? From your logcat it seems that you had problem with connection. I want to do logout functionality how can I do this.How I release the consumer key and consumer secret key and where I have to return it. Hi Payal, to logout, simply call the resetAccessToken() method. Look at the example on TestConnect.java. Help me for log out option in twitter in android app. I can login but, when I try to post a message; ıt returns “401:Authentication credentials were missing or incorrect. hi, firstly thanks alot for codes and article. I use your codes, and I can login. When I try to post a message, it returns to me ” 401:Authentication credentials were missing or incorrect. Can you please suggest some for the same “How to Post Twitter Status from Android” with “Sencha Touch” in place of “Android”? All that my application is doing, is creating the TwitterApp object, setting the listener, checking for accessToken (authorize if not) and then attempting to post. I’ve searched and searched and cannot find any solution to this. Any assistance would be appreciated. After a little more experimentation, I was able to get by this by entering a valid URL for the Callback URL on dev.twitter.com/apps and placing the exact same URL in my app. This only works with http, https still throws the same error. Great find..i’ll also try to find the answer..
api.twitter.com should work on android 2.1 and above. 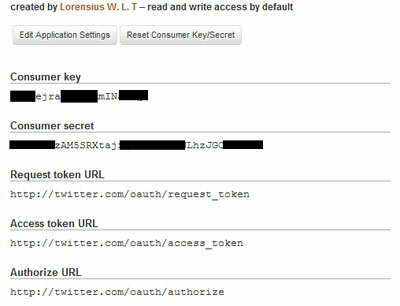 If you use twitter.com/oauth you may have issue with android 2.1. Did u test in emulator or on real device? 1) internet connection is works properly. Please help i need immediatly. In My application i want to use to tweet the image with the text. So what more i have to do with your code ? Ive tried your application but it is unable to connect to twitter and it prompts “twitter connection fail”. Try to use api.twitter.com instead of twitter.com for oauth url. Ive changed to api.twitter.com for the oauth url but i still cant connect to twitter. Have u set the callaback url on twitter app web settings? Hi lorenz. Thanks for the great work. I do all of this (I’ve downloaded your zip file and altered it slightly for my consumer key and secret key, but I can’t get the web view to return to the app. It just goes to the callback URL. I use the callback url http://redir.domain.com (domain is actually replaced with my client’s domain name). My web host sends .domain.com to http://www.domain.com, so the webview just shows the http://www.domain.com page. I hope these screenshots help to explain the situation I’m up against. When I select to authorize, it says it’s “redirecting you back to the application…”, but it never goes back to the application. Instead, the WebView shows the home page that the redirect URL eventually goes to. The WebView never goes away, and I never get a token to store in the preferences of the app. It should return to app. The callback url has no effect on mobile app, it only works for web app. Where did u run the app? what version of android? Any Luck for help please :)? this is exactly what i need for my app. 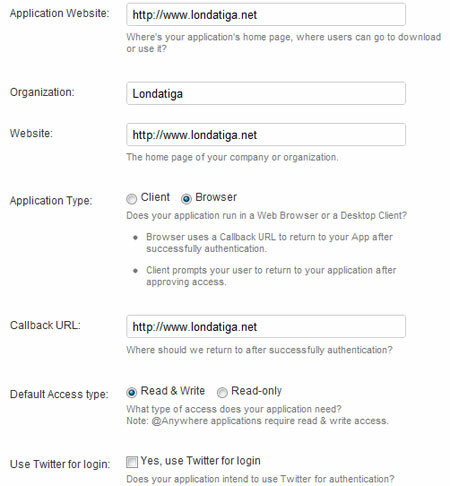 Have u set the callback url on twitter web settings page? Great tutorial. I am a noob to android api and eclipse and stuff, I am facing a problem. I downloaded the jar files that you said, added them to my project. I had created a new project by the name flixtermovie. Now to create the classes TestConnection.java, I right click the src folder of my project flixtermovie and click add class and ype in the name, after that I copy pasted your code. The problem is, there are lots of errors, most of them being “cannot be resolved to type” for various things like Activity, TwitterApp,CheckBox and so on,. Im guessing my libraries are not called properly, how do i solve this issue and get your code working on my computer? Please help me out, thanks a lot. I think you forget to import the required class first (Activity,Checkbox etc)..
What do you mean helper classes? all codes are available on github as referenced in my tutorial. One thing I noticed is once I logged out, next it will not lead me to login page at all. Why it so? Pls reply me. Hi Ian, the problem was fixed in the latest version on github. Try to download the source code from github. It seems that even with that fix implemented in October for some reason the second log-in is showing a blank WebView. The first time the user logs in, the Redirecting URL receives an oauth verifier as a parameter, where as the second time the Redirecting URL only contains the oauth token. Any help is appreciated. Thanks for the great tutorial. Hi Dave,thanks for your info. I’ve tested on nexus s with GB and froyo on emulator they works fine. I’ll try to test it again and find the bug. and it seems to have fixed my problem. I don’t think this will cause other issues but now when the user wants to log out they are technically signed into the browser they just need to sign out of it as well or just re-authorize the application if they wish. If it helps, I have been testing on a Samsung Galaxy S running Android 2.3.3. Ok i see, the problem is on webview. thank you for the solution, i have to test it again and make sure it will not cause other issues. One thing I noticed, After Logging out, next time Iam not leding to login page at all. Why It is So? Pls Reply me. 11-27 16:40:31.789: INFO/global(313): Default buffer size used in BufferedReader constructor. It would be better to be explicit if an 8k-char buffer is required. I am getting blank page in autorization. Could you give me the error log messages? New to integration of twitter. I really thank you, because you helped me a lot!! An getting an error in Log cat has : “unauthorized access 401 error”. Can u plz give me the solution for this. Thanks for this twitter app code, I am getting through all the authorisation bits fine but for some reason I cannot post to twitter, log cat gives me the following error. I used your last code updated, please help. I got fixed one issue related to posting the tweet. The reason for twitter posting failed is due to app registration in dev.twitter.com which is in read only mode. I updated it to read and write mode which cleared the problem.It worked for me if it is not relevant pls ignore. nice to see u again , i am facing problem, i dont want the pin each & every time user login, & previously it was possible to share from twitter but now i cant share from twitter..
Great post. Was able to post to twitter after a few glitches. Great Post. Was able to use this code on my Android app. I am getting this error in TwitterApp constructor. I can login in twitter but my comments are not showing in twitter.I am using android2.1 and I have change the twitter.com to api.twitter.com.But still I am facing the problem.Please help me. I am using your code .I can login into twitter but I can not see my message into my twitter account.I am using android 2.1 and I have changed the url from twitter.com to api.twitter.com but still I am facing the issue.Please help! I downloaded the code and tried it exactly with no changes (except twitter consume key and secret key). But, after I ran it, it always bring force close. Any solution for my problem??? 04-30 17:47:32.825: E/dalvikvm(247): Could not find class ‘twitter4j.TwitterFactory’, referenced from method net.londatiga.android.TwitterApp. 04-30 17:49:44.035: E/dalvikvm(270): Could not find class ‘twitter4j.TwitterFactory’, referenced from method net.londatiga.android.TwitterApp. hi lorenz, i need to implement the twitter posting but not only text but images also can you suggest some post for that also. this help me a lot thx for posting.. authentication is working proparly..but when i posting any text..its saying post failed plz help me…. 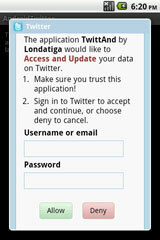 Set your application permission in twitter web site. Are you getting error code 403 (with duplicate message error)? If your app is sending the same message as in a previous post, try changing the message. can some one post the full code of this? can some one post full code of this? Just in case anyone wanted to know how to clear the user’s credentials from the Twitter webview… (In addition to clearing the access token from the app’s shared preferences, this modification forces the user to re-enter their username and password on the Twitter webview when signing back-on). Hello lorenze, thanks for your post. I am able to connect to twitter and post successfully. But when i deleted the connection and try to connect again it is not working. It is showing a blank white page and also it is not calling the onError method in TwDialogListener. Please tell me where it was going wrong? When i am click on Submit it will display a Toast :: Review Post then after sometime another Toast display “Post To Twitter Failed.”. please Solve it…. please…. please…. Could you give me the log cat error message for more detail? Hi, I need a help about that codes. and then crashes the application. Could you give the log cat error message for more detail? Could you give me the log cat error message? a. Create “libs” folder in your project directory without double quotes. b. Copy all the required jar files and paste in libs folder. I downloaded your application and just modified the twitter_consumer_key and twitter_secret_key and set it to my app key. Im using android 2.3.3. Looks like its not working perfectly. The problem is the app unable to connect to twitter. Any sugestion and comments are very much appreciated. I tried to update it but no luck. and now it works… But i have a problem with CALLBACK_URL… I’ve set it to None when i create twitter app and now it’s not returning token to app, just require user to get pin code into app, and stuck there… What should i do? How should the CALLBACK_URL be? When i logout to current user and try to login to another user am getting login filed.Am also clearing cookiemanager.am getting following errors. 08-30 16:20:04.344: W/System.err(1846): java.lang.IllegalStateException: consumer key/secret pair already set. help me thanks in advance. I managed to make it work by re-initializing instance, like this..
i used the above code with the jar files attached to it…if i m to use the latest upgraded version of the above jar files i m getting error in the source code..so i used the jar files attached below..works fine.but not able to post on wall..got the toast saying the tweet has been posted..
Would i please you for source code (api 1.1) to? i want ask with your code, will access token be expired although user has been login and not logout?and if yes, how to make access token again without login again. Hi I’m having a problem connecting to twitter (program starts up in my eclipse emulator and when I click on “Twitter (not connected)” and it tries to connect it comes back with “Twitter Connection Failed”)(the emulator does have an internet connection). I’ve set the twitter_consumer_key and twitter_secret_key in both TestPost.java and TestConnect.java with my own. Other than that I have not changed or added anything else to the code (gotten from github). Is there anything else I need to set in the code to connect to Twitter. I would assume there would need to be some sort of username and password, though if it connects to twitter then I would assume Twitter would handle that instead of your code. – WARNING: Application does not specify an API level requirement! I use debuging usb connection. I debug your facebook connection code before. It work correctly. But I got error on your twitter connection code. in simulator as well as in device i am getting this error. i have all config jar files and also keys. Excuse me: how to release the twitter with image?For twitter API 1.1, your code is still valid? I got error on that…what can i do??? Did you get to manage work around of this issue please? I’m very new to android, and still learning how to develop an android program. I did exactly these steps, but in the end my program is unexpectedly force closed. Could you give an update for Twitter API 1.1 and Twitter4J 3.0? The app fails to log in! Toast showing: Twitter connection failed. Changed the keys, updated the links…. Coul you post an update for Twitter API 1.1? What must I do to migrate from 1.0 to 1.1? thank you for your blog.I used your code and starting a am getting force close.This is the error displayed in logcat:java.lang.VerifyError: net.londatiga.android.TwitterApp.Please help me,I dont know why I am getting this error. hai i tried this code…i replaced my secret key and consumer key for this code..no errors but wen i run this in emulator always its giving twitter connection failed..i could not solve this problem…please solve this…thanks in advance.. But why we need again in in this java file…any way we authenticated in TestConnect.java file..
here i have to run the app which means the twitter login page is opened. i have enter correct login detail means its go to post page..here i have wrote Hi Good morning.afterthat click submit button means thr review posted message is displayed on app.Now i have to check my twitter home page means the data is not posted. Thanks for the example app. I did have to update the URLs to get things working. Thanks again. i have updated the urls and tokens but i am getting “twitter connection failed” did u resolved the issue ? I have added all the library into project and it was working perfectly before 11 June 2013, now its showing the error connection failled, can you please sortout this issue,so that we can use the example code further. i think its happening due to change in api from v1 to v1.1. Thanks for your tutorial, Its saves my day. And can you please tell me how to get user data like User Full name, email address etc. Get “Error getting request token” every time. Consumer key and consumer secret are correct! I found solution for this problem. Developer must enter request url on dev.twitter.com. I am having the same problem. What “request url” are you talking about, and where on dev.twitter.com do we enter it? The example helped alot . thanks for posting the code….. Thank you for you giving this code I am going to use this code. How do you log out the user from twitter? Don’t need to logout, there is no api for logging out. Just clear the saved access token and webview cache. I want to get rid this problem please help me soon. . .
Hi, I realized that the posting does not work when there is special character. How can it be resolved? Thansk! I’ve downloaded your new library, but i’m unable to get Access Token. I’m getting the following exceptions in log cart. looks like i’ve some problem with Callback URL. can you please help me out. You should use this code for show dialogs for prevent monkey user which spam back button. I am getting unauthorized error. Hi I am developing an app and I used “https://github.com/lorensiuswlt/NewAndroidTwitter” twitter library for sharing in twitter.It was working perfectly but now it’s not working on Android 4.3(samsung s3),Android 4.1(Sony xperia sl) however it’s working on 4.4 devices(nexus 7 and sony xperia zl).I just debugged the code and it seem’s the issue is caused at the webview.If I am putting a break point on the shouldoverloadingurl method run the step by step it seem’s to work .Guess there is slight timing issue.Do you know anything about it. Thanks for the library, but I’ve a problem. It works in API 19 but not in 16, 17 or 18 since August. It’s very strange. P.D. I tried with the old library, using twitter4j.jar and the result is exactly the same. Thank you very much for this great work. I had lots of problem finding a starting point for integrating Twitter into my app and this code was a great beginning.